Taste will split on Saturday night and that's definite. After one of the most ludicrous of upsets, bassist Richie McCracken and drummer John Wilson have refused to work with leader Rory Gallagher, and the band will cease to exist after their final date of the current “home” tour of Ireland, at Queen's University, Belfast. They are to form a new band. Gallagher's future is as yet uncertain. Gallagher was under the impression that HE employed Wilson and McCracken, and had in fact always been under this impression. They were purely working for HIS purposes. “The matter became absurd just before the start of last month's Polydor tour, when Rory demanded that he be given all tour earnings, so he could pay us – seemingly what he felt like paying us,” John told me as we traveled to Sunday night's gig in Newry, County Down. Exclusive report from Ireland on the break-up of a mighty successful band. How Taste managed to stick together over the last month can only be described as a miracle. There was a massive sense of uneasiness during the whole Polydor tour of Britain with Stone the Crows. 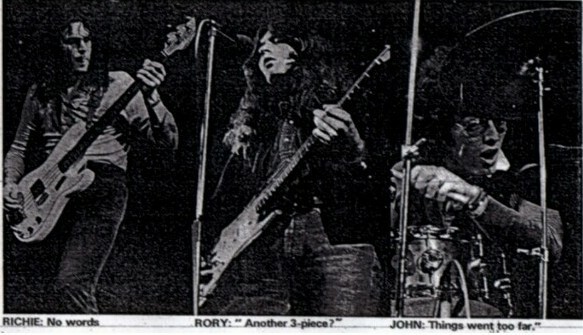 Rory Gallagher was almost in solitary confinement and he joined Richie McCracken and John Wilson only when the group took the stage. "It wasn't a case of us not speaking to him; he just didn't want to know us. He wouldn't travel with us in the van. He'd walk away from us. That's no way for a group to exist,” John Wilson told me. "We worked with him on stage, of course, because we were musicians, and part of a group – but it must be general knowledge that we've been playing crap for the last year." “He really made us feel he was the superstar. This was terrible. Sometimes he'd really muck us up – sometimes treating us on stage as though we never existed. I mean, it just began to go too far when he'd do three solo numbers on the run. Other times he'd start off a 12-bar and then suddenly play on nine-bars. You know, really trying to mess us up,” said Wilson. The tragic thing about the split is that neither Gallagher, Wilson or McCracken wanted it to happen. Already £35,000 worth of bookings have had to be canceled. The group has been causing a storm throughout Europe – and their Irish tour has brought scenes that can only be compared with Beatlemania. Eddie Kennedy whose brilliant managership has taken Taste from a few quid a night in Cork to a steady £2,000 a-gig, is extremely upset about the break. “I've devoted two-and-a-half years to putting them where they are now, and then this thing happens,” he told me at his Belfast home. Gallagher was earning more than the other two, but this was technically correct. He got more than twice the amount Wilson and McCracken got on record royalties but he'd done nearly all the writing. Rory's views on the whole matter? Well, I found Rory in the changing room at Newry Town Hall, and he succeeded in talking about everything except the split. You can't help liking the guy, because he's so nice. It wasn't a case of him making no comment. He just smiled at questions. If the fact be known, I believe he will not discuss it because he does not like putting people down. He just talks about music. What was he going to do after Saturday? Throughout the whole of Sunday evening not a word was passed between Rory and the others. He stayed in the dressing room most of the time. Wilson and McCracken changed in the same room, but again nothing was said. The atmosphere was, to say the least unnatural. Rory tuned up with McCracken, but apart from nods there were no words. Yet when autograph hunters came into the room, Rory was chirpy and extremely kind, and good-humoured. When the time came to go on stage, they walked on like any other band, and to anyone in the audience things must have looked completely normal. Rory raved away, McCracken went wild on bass, and Wilson looked obsessed with his excellent drumming. You couldn't really believe what was actually going on. After giving two encores, they came off, and then in a matter of seconds Rory was separated from the rest. He chatted with fans, but not with the other two, who changed and set off home. Earlier, when we were served with tea and sandwiches, Rory had come down into the kitchen, but eaten in a corner on his own. Yet somehow he gave that impression that he was not being impolite or offish. McCracken and Wilson will be forming a new group almost immediately. The name Stud has already been registered. Other members have not yet been confirmed. John Wilson told me he was sad about the split – “but quite frankly the music I've been following, and wanting to do for the last year is nothing like what we were doing. I mean it just became comparable to a circus. They came along to see us, ‘perform.’ I think we could have stood on our heads, and people would still have gone mad. “I tried to introduce a little more intricacy into Taste numbers that just never called for this style of drumming. I put them in – but realized that it didn't make any difference – I'm sure the audience never noticed. “That obviously upset me somewhat. Many thanks to Brenda O'Brien for digging this article up and for typing it.